Wedged between an economic Scylla that privileges the study of science and a Charybdis where history before the Middle Ages struggles to survive in popular imagination, the study of Classics—from the Bronze Age civilizations of the Middle East and the Mediterranean through medieval Byzantium—hides in general obscurity in our contemporary culture and is in decline in many of our universities. A cottage industry of books and articles analyzing the closing of Classics departments attests to the longstanding crisis in this once dominant pillar of the humanities, which already stand in the shadows of newly built temples of biology and chemistry. The changes that have engulfed the Middle East for more than three years and the uncertainties about the region’s future, however, offer a rich opportunity for Classics to claim a voice in assessing a region of global importance. In the struggle to glean the right narratives from the Middle East’s transition, knowledge of beginnings can inform—even anchor—our assessments. The study of the early civilizations of Mesopotamia, Anatolia, and the wider Mediterranean, as well as the influences these peoples exerted on each other, also tell histories that help keep us from trumpeting today’s challenges as unprecedented. The remoteness of these civilizations, the difficulty of learning ancient Greek, and a common perception that a Ptolemaic cultural system positing the West at its center is yielding inevitably to a diversity of ideas and culture outside the West give pause to undergraduates weighing a degree in Classics. Yet, within the study of Classics are rooted not only the exceptional traditions of Western law, science, art, and politics that have shaped the modern era, but also the patterns of interaction among civilizations across the Mediterranean world and the broader Middle East. Minoan Crete owes a political debt to Mesopotamia, Greece can thank Phoenicia for its alphabet, and the Abbasid Caliphate can acknowledge the gift of Aristotle and Greek mathematics. These connections presage the intense exchanges of our modern age of globalization. The task of remaking social compacts in much of the Arab world today would be familiar to Athenians of the sixth century b.c. who experienced the arc of reforms and institution-building launched by Solon’s constitution. 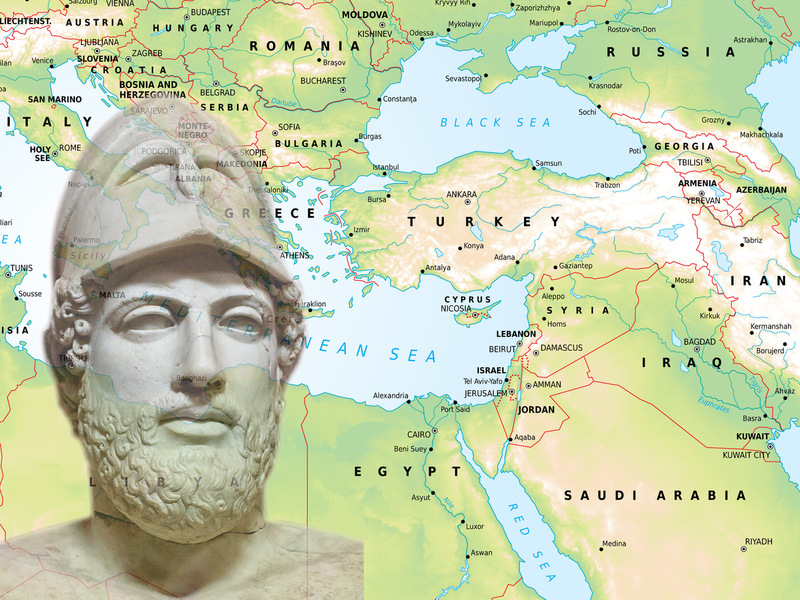 As sectarian and ethnic rivalries resurface throughout many states in the Middle East, the study of Cleisthenes’ unprecedented success in transcending the local allegiances and identities of Athenians to build a state can guide our approaches to the region’s political development. Similarly, the insights of the tragedian Aeschylus on the evolution of Athens from traditional society to a democracy under the rule of law can further contribute to our assessing the internal dynamics of states seeking to transition to post-authoritarian governance. The unfolding political transitions in the Arab world have also included significant ideological ferment, as Islam has returned to governance in the wake of failed secular Arab nationalism. The trend has obliged observers in the West—long accustomed to viewing religion as a private matter decoupled from the state—to revisit religious ideas as a serious political and societal force. For some, the task has been so contrary to our post-Enlightenment secular conventions that Islam itself has been interpreted primarily as an instrument of more familiar political reform. Others have seen in the Islamic political and cultural revival a threatening pre-modern regression that is exclusively religious and traditional. Revisiting the long process of religious change in imperial Rome offers a potentially more helpful analytic framework for considering how Islam and the forces of globalization may interact to develop a new Islamic culture in the Middle East. Just as Christians absorbed selectively the tools and institutions of religious architecture, political organization, letter writing, rhetoric, and philosophy from their pagan predecessors to forge a Christian civilization, it is worth considering what Islam has already chosen and will choose to adapt from a secular, globalizing culture sprung from the West. If the transformation of identity and worldview that gradually overtook pagan Rome between the first and fifth centuries a.d. is illustrative, a diverse culture of modern Islam—grappling with the materialism, individualism and democratization that circulates globally—will be slow to emerge and initially fragile. Similarly, as we witness periodic storms of Islamic iconoclasm we should recall that representation of the sacred in images—a practice associated with the earlier pagan civilization of the Roman world—was also deeply contested in eighth and ninth century Christian Byzantium and encumbered with political, not just religious, motivations. The contemporary turmoil of the Middle East has raised key questions not only about how societies will organize themselves but also about how power will be distributed more broadly in the region. Again, the study of the ancients offers a powerful perspective. Classics remind us that there was a unifying Roman civilization anchored in the Mediterranean world and that this singular power eventually separated into three distinct civilizations: Christian Byzantium on the Anatolian plateau, Islam along the southern rim, and Medieval Christendom in Western Europe. On the margins of this system—whose parts often overlapped at the crossroads of the Eastern Mediterranean—Persian power frequently inserted itself. This ancient strategic map is uniquely understood through Classical studies and has its echo in the contemporary Middle East as successor Arab states, Turkey, and the West—with Iran again at the region’s door—interact to shape anew the region’s ancient stage. Discerning which states might dominate this strategic geography can also benefit from the lens of Classical studies. The breakout moments of the earliest Bronze age centers of urban literate civilization—Sumerians in Mesopotamia, Egyptians in the Nile Valley, and Hittites in Anatolia—established political powers whose histories have shaped the national identities and aspirations of persistently influential states such as Iraq, Egypt, and Turkey in the modern era. The founding of Ankara, sited near the ancient Hittite capital, as the modern Turkish capital; the naming of elite military units in Saddam Hussein’s Iraq after Babylonian kings; and the association of Egypt’s Pharaonic past with modern Egyptian nationalism all attest to the long reach of the Bronze Age. The social sciences bring effective assessments of economies, militaries, and governance—as well as an appreciation of the influence of the relatively recent Ottoman past—to evaluating a transitioning Middle East. Nonetheless, Classics can deliver an understanding of the roots of national identity as well as of the original determinants of political and economic power that continue to ripple into the modern era. In these ways, Classics offers compelling analytic frameworks that are able to inform interpretations of contemporary events. These perspectives are helpful to the task at hand in the Middle East. Let us invite professional classicists and their supporters to join the discourse. Then, we may also succeed in winning new students to a discipline too formative to abandon and too useful to forgo. Andrew S. Gilmour ’83 concentrated in the comparative study of religion and studied ancient Greek. He is a member of the CIA’s Senior Analytic Service. All statements of fact, opinion, or analysis expressed are those of the author and do not reflect the official positions or views of the CIA or any other U.S. government agency. Nothing in the contents should be construed as asserting or implying U.S. government authentication of information or CIA endorsement of the author’s views. This material has been reviewed by the Agency to prevent the disclosure of classified information.